If any Bible verse personifies the word "action," that has to be it. No way, Bible! Three more dude's names?! And did you say "Mahalalel?" That guy is crazy! I can't imagine what comes next! Whoa, Bible! Four more dude's names?! That's one more name that the number of names in each of the first two verses! And I haven't even hit a verb yet! How is any human expected to handle this much awesomeness!?!?! Lucky for all my faithful readers (and I'm talking to both of you), I survived the rest of 1 Chronicles so the Word series will continue. After doing a little research, I found out that there is some difference between the books. Chronicles tends to paint a more positive picture of similar events compared to Samuel and Kings. Seems like Samuel/Kings were written during the exile (a dark and oppressed time in Jewish history), while Chronicles was written later on, after these stories had taken on a more nostalgic, good-old-days feel. The passage of time can reframe memories, I guess. 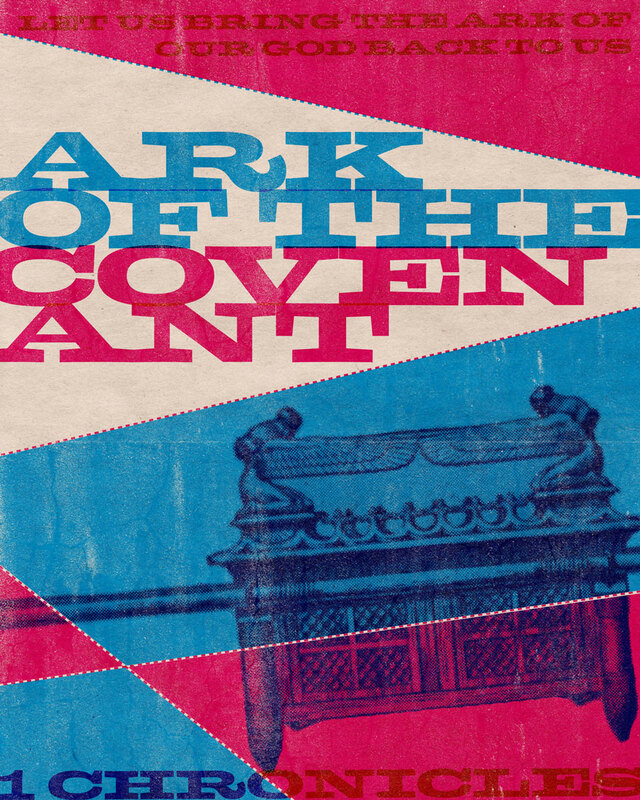 For this week's design, I chose a passage where David (king at the time) brought the Ark of the Covenant back to Jerusalem. I thought I knew everything there was to know about the Ark of the Covenant (if you open it, angels come out, fly around and melt all the Nazis and bad guys), but after a little research, I found out I still had a lot to learn. Basically, it sounds like the Ark held Yahweh's presence and was really important to the Israelites. During the days of King Saul (king before David), the importance of the Ark among the people seemed to fade. It wasn't even kept in Jerusalem anymore. When David became king, he changed that and brought the Ark back to Jerusalem – and partied the whole way. The Ark seemed to be all about remembering the past. Every object in there was an example of how God provided for the Israelites. It makes me wonder what I have in my life that helps me remember what God has done for me... or if I've allowed the importance of those memories fade. Next week, Chronicling part two.